In Matthew 14, we learn about when Jesus walked on water. His disciples were in the boat and strong winds came and they were in trouble. The boat was far out on the water, so Jesus went toward them. When the disciples saw Him, they were afraid and thought he was a ghost. Jesus said, “Don't be afraid, take courage, I am here!” Peter then called to Him and said “Lord, if it’s really You, tell me to come to You, walking on the water.” Jesus said “Yes, come." So Peter stepped out onto the water and started walking to Jesus. But when he saw the strong winds and waves, he became terrified and yelled for Jesus to save him. Jesus immediately reached out and grabbed him. Do you see where Peter kind of went wrong? He saw the storm and took his eyes off of Jesus! This reminds me of life sometimes. We are so full of faith, trusting God with everything. Focused solely on Jesus. Then a big storm comes (a.k.a. financial trouble, marriage problems, stress, failures, etc), and we take our eyes off of Jesus and start focusing on our problems! And then we begin to sink, just like Peter! Sometimes we try to fight our way out and fix our problems on our own, but we keep sinking deeper and deeper. And we just can’t figure out how we are going to get out of it. When issues arise, we take our eyes off Jesus! We focus more on our problems and worry about how WE are going to fix them, instead of calling out to Jesus for help. It’s a very simple concept, if you think about it. If we need help, we should ask for help. All we have to do is cry out to Jesus saying “save me Lord,” just as Peter did, and he will immediately reach out and grab us. He will save us from sinking further and further into our problems. We have to keep our eyes on Jesus, or we will keep sinking and we will flounder. We will keep staggering helplessly in life, not getting anywhere. 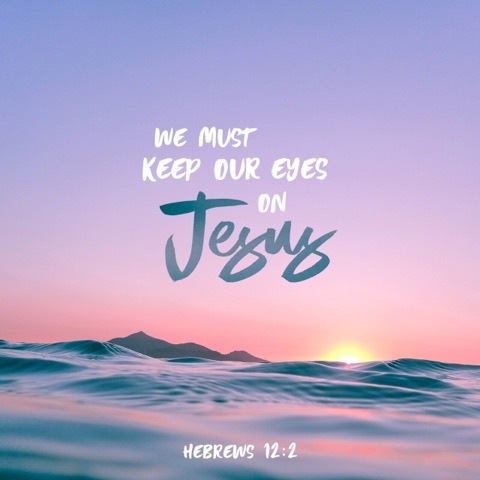 Even in the good times, we need to keep our eyes fixed on Jesus, so that when bad times come, we stay the course and it will be that much easier to focus on Jesus rather than our problems! We must keep our eyes on Jesus in this race we call life! Great word! I sure needed this today. Keeping our eyes on Jesus! Yes!